From left to right: Jack Dalton of Hot Springs Mountain Club, which was named Partner of the Year; Jane Laping, one of our Volunteers of the Year; Brownie Newman, Elected Official of the Year; Neill Yelverton, Leesa Sluder, Peter Krull, Kerry Keihn and Catherine Campbell of Krull & Company–named Green Business of the Year; Doreen Blue, our other Volunteer of the Year; and Will Harlan, recipient of The Esther Cunningham Award. Download high resolution image. MountainTrue presents this award in the name of Esther Cunningham, a Macon County resident whose concern for the environment prompted her to found the Western North Carolina Alliance (now part of MountainTrue). The award is presented to a MountainTrue member who has demonstrated outstanding community service in conserving our natural resources. Will Harlan is an award-winning writer and editor-in-chief of Blue Ridge Outdoors magazine and an elite, long distance runner uses his talents to bring attention to environmental issues. Each year, Will travels to the Copper Canyon of Mexico to work alongside the indigenous Tarahumara farmers to establish seed banks, goat herds and clean water projects. Here in WNC, he’s been a committed advocate for the conservation of public lands and wild places. Will has long advocated for the protection of the Big Ivy section of Pisgah National Forest, and was instrumental in getting a pro-Wilderness resolution adopted by unanimous vote by the Buncombe County Commissioners asking Congress to designate expanded wilderness for the Big Ivy and Craggy Mountain areas. Will also played an active role in promoting the win-win MOU put forth by a coalition of wilderness advocates, conservationist and recreation groups that supports more trails and more public access, and also protects more backcountry and more wild places. MountainTrue presents the Green Business Award to a local Western North Carolina business that has exhibited leadership in implementing green practices, getting other businesses to make their operations more sustainable or engaging in environmental advocacy. Krull & Company is a certified B Corporation supporting the environment through the investments they make for their clients. From alternative energy to energy efficiency, water, natural and organic food and products and technology, Krull and Company focuses on positive, next economy companies, and exclude fossil fuels and other environmental offenders from their client portfolios. Krull & Company ensures their clients money is invested in a way that honors environmental values, and use the power of shareholder advocacy to drive corporate change from the inside. 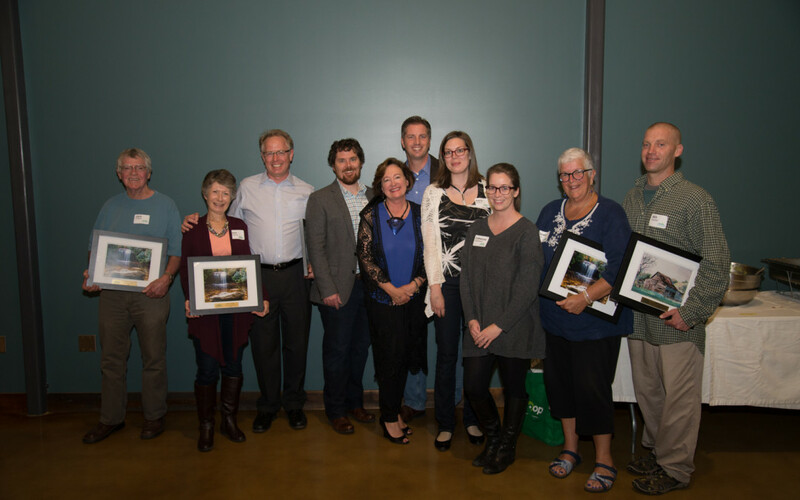 MountainTrue presents the Volunteer of the Year Award to an individual(s) who has demonstrated consistent commitment by volunteering time at events, on program work, or through other MountainTrue activities. This year, we gave out two awards to some very deserving recipients. Doreen Blue moved to Hendersonville from Rhode Island in 2005 and immediately got involved with ECO, one of the three organizations that merged to form MountainTrue. She started by joining our hikes, then took the training for the SMIE program to do macroinvertebrate biomonitoring in local streams. She now helps coordinate that program as part of our Clean Water Team. Doreen also takes monthly water quality samples for our VWIN program to help on zero in sources of water pollution. She has worked on Henderson County Big Sweep and Earth Day celebrations, been a member of the Recycling Team for the last 5 years, and organizes MountainTrue’s annual community-wide Christmas tree recycling program in Hendersonville. Doreen is a master seamstress, and has made the costumes for our mascots, the Bag Monster and Mr. Can, to promote MountainTrue’s recycling programs in local parades and for educational events. Jane Laping is one of the founders and a current steering team member of the Creation Care Alliance of Western North Carolina, and as such she empowers faith communities to be advocates for the environment. Jane leads hikes, travels to Raleigh to talk with policy makers, writes grants, testifies at public hearings and plants gardens. She is an active member of First Presbyterian Church where she has helped lead conversations about the Pope’s Encyclical on the Environment, Fossil Fuel Divestment and solar powered electric car chargers for the church parking lot. MountainTrue presents the Partner of the Year Award to an organization that has been a staunch partner with MountainTrue on key campaigns and programs throughout the past year. Hot Springs Mountain Club have done a lot for the community over the years, including creating the Betty Place Loop and starting the Bluff Mountain Music Festival. Last year, the club created the new 3.5 mile Bluff Mountain Loop trail. This past year the Hot Springs Mountain Club and MountainTrue partnered on a two-day Bluff Mountain Bio-Blitz to document the incredible diversity of flora and fauna on Bluff. Over 50 people, including 7 college professors participated. It was a great time and over 400 species were identified – including a lichen that had never been seen south of Canada. The Hot Springs Mountain club acted as guides, hosts, and facilitators for the event. Because of the efforts of these local citizens, there is hope that Bluff will be treated as a special place in the new Forest Plan for Pisgah National Forest. Accepting on behalf of the club was Jack Dalton. MountainTrue presents this award to a city, county, state or federal elected official for either a specific conservation action of singular importance or for a strong and consistent commitment to conservation over time. Prior to his service on the County Commission, Brownie Newman served two terms on Asheville City Council where he led a number of environmental and sustainability initiatives, including the adoption by the City of a carbon reduction/sustainability plan that continues to drive improvements every year. MountainTrue is Western North Carolina’s premier advocate for environmental stewardship. We are committed to keeping our mountain region a beautiful place to live, work and play. Our members protect our forests, clean up our rivers, plan vibrant and livable communities, and advocate for a sound and sustainable future for all residents of WNC.